You are currently browsing articles tagged train ticket. 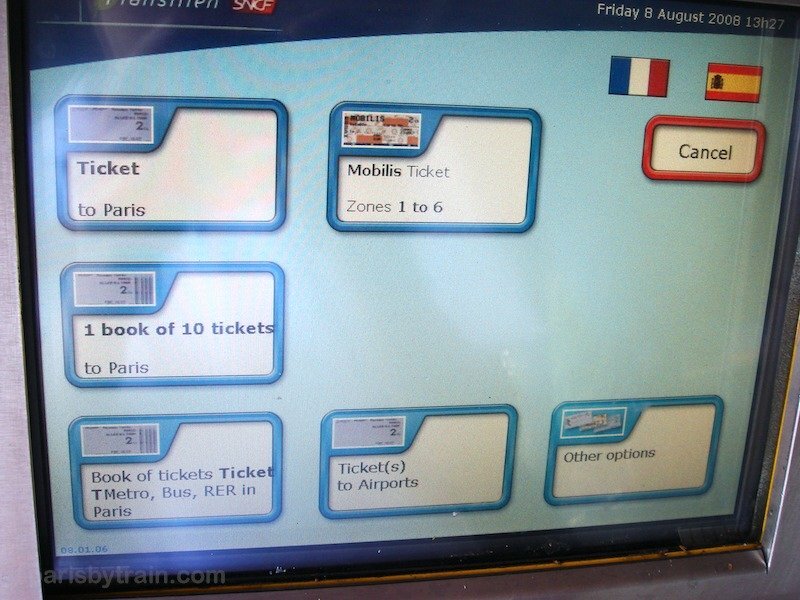 This is a visual guide to using ticket vending machines found in and around Paris for purchasing train tickets and carnets (books) of tickets for station to station travel (between cities) around the Ile-de-France region, serviced by Transilien, Ter, and RER train networks. 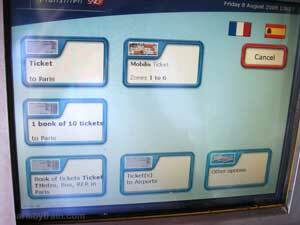 For ticket machines selling tickets for the Paris Metro, Bus, Tram and RER, see the Paris Metro Ticket Machine guide. 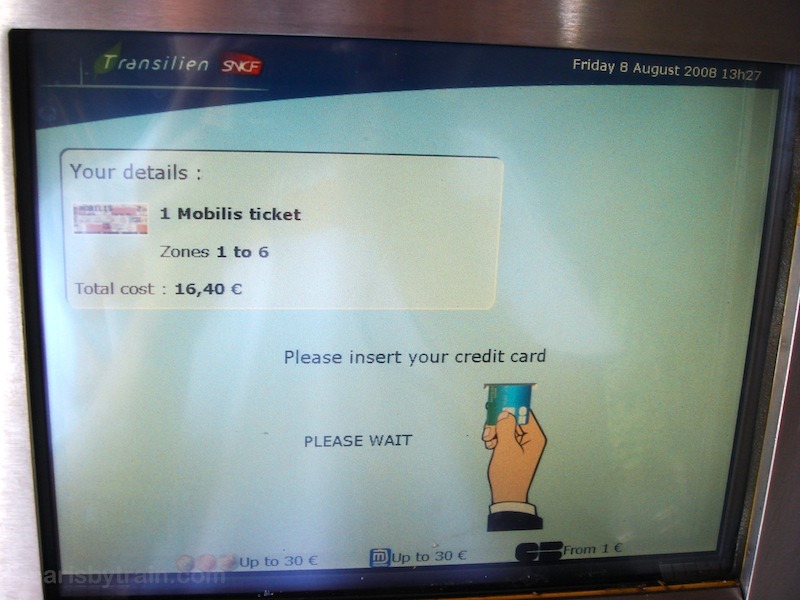 This is a photo of a train ticket vending machine found throughout Paris and Ile-de-France train stations (Gare de Lyon, Gare du Nord, Gare Montparnasse, Gare St. Lazare, Gare de l’Est, Gare d’Austerlitz, Gare de Bercy, plus stations through Ile-de-France) and at some Paris Metro/RER stations. 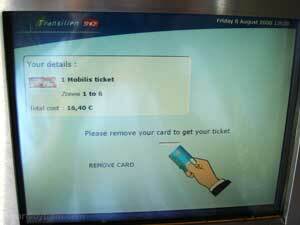 These ticket machines operate with a touch screen. They accept Euro coins and European or smart-chip enabled credit/debit cards. Tickets sold from these machines are for station to station travel, inside and outside central Paris, within the Ile-de-France region. 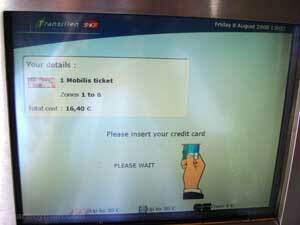 You may also purchase tickets for the Paris Metro, Tram and Bus (Paris Metro “Ticket t+”, carnets [“booklets”] of Paris Metro Tickets) from these machines. Tickets and change (if necessary) are dispensed into the bottom tray. Ticket printing can be somewhat slow, so be patient when completing your transaction and wait till all of your tickets are dispensed. Passes such as Pass Navigo Decouverte, and Paris Visite Card, are not sold from these machines. You’ll have to visit a ticket window/booth to purchase these, since they come with additional paper identification cards and/or contactless smart cards. Above the screen is a large black bar containing a CB (Carte Bleu) debit card symbol and a “Rend La Monnaie” (“Makes Change”) note. When a ticket vending machine is not working, a red “Hors Service” (“Out of Service”) sign will be lit on this black bar. Check that this sign is not lit before attempting to use a given machine. Also, if the machine is low or out of coins and cannot make change, a red sign will be lit just below Rend La Monnaie to indicate this. 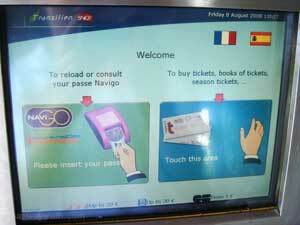 Looking closely at the payment panel we see that the ticket machine accepts Mastercard and Visa credit cards, Carte Bleu debit cards, Euro coins and Mondeo cash cards. North American and non-smart chip credit cards will most likely not work with any ticket machines nor at ticket purchase windows. Keep this in mind and have cash on hand before queuing to buy tickets at Paris train stations. 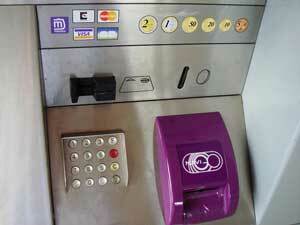 Visible in the above photo is the large purple Navigo card slot. 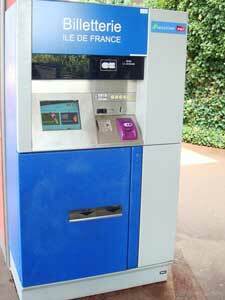 This slot can be used to recharge a Pass Navigo or Pass Navigo Decouverte with Carte Orange week and month transit passes. The starting screen of these ticket vending machines (“billetterie”) offer language choices at the top right hand corner. 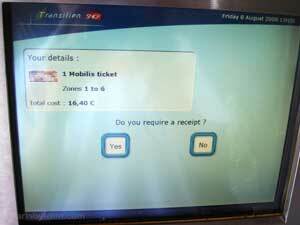 In this photo we see the choices are English and Spanish languages for this train ticket machine. 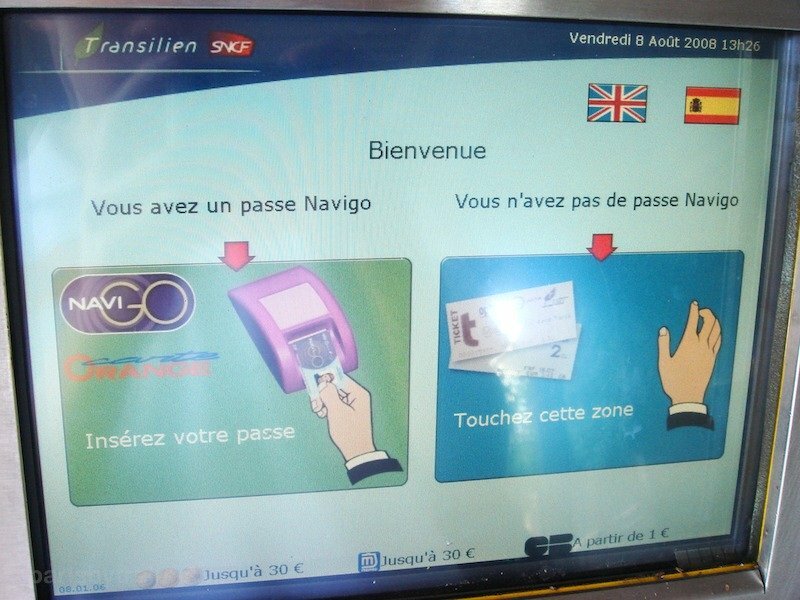 After switching to English we see that our options are either to recharge a Navigo Pass card or to buy individual tickets or carnets of tickets. To charge a Pass Navigo, start by inserting your card into the purple Navigo card reader (visible in the second photo above). Touching the blue rectangle will start a ticket buying session. The “season tickets” mentioned on the second choice refers not to football tickets (unfortunately), but rather ticket based fares for station to station travel which work for a set period of time. Single Ticket to Paris: This machine, being located outside of Paris, offers the most popular ticket first: a single ticket from this station to Paris. These “station to station” tickets, priced on the distance between stations, are known as a billet Ile-de-France. The price of these tickets varies depending on where you are buying the ticket. For example from Charles de Gaulle Airport to Paris the price of the billet Ile-de-France would be 10€ (January 1, 2015). Fontainebleau-Avon to Paris Gare de Lyon is 8,85€. 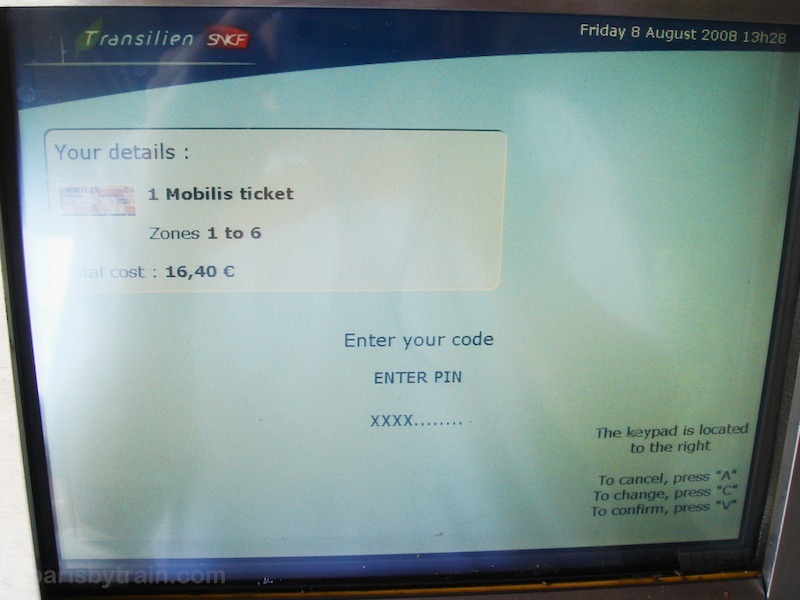 Mobilis Ticket: a day pass in the form of a multiple use, paper ticket coupon. Good for unlimited voyages on trains, RER, Metro, buses and trams within Zones 1 to 5 (all zones) for a single day until end of service (not a 24 hour period). 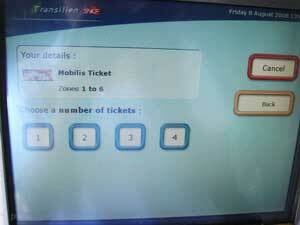 The number of zones covered by the Ticket Mobilis depends on where the ticket machine is located. 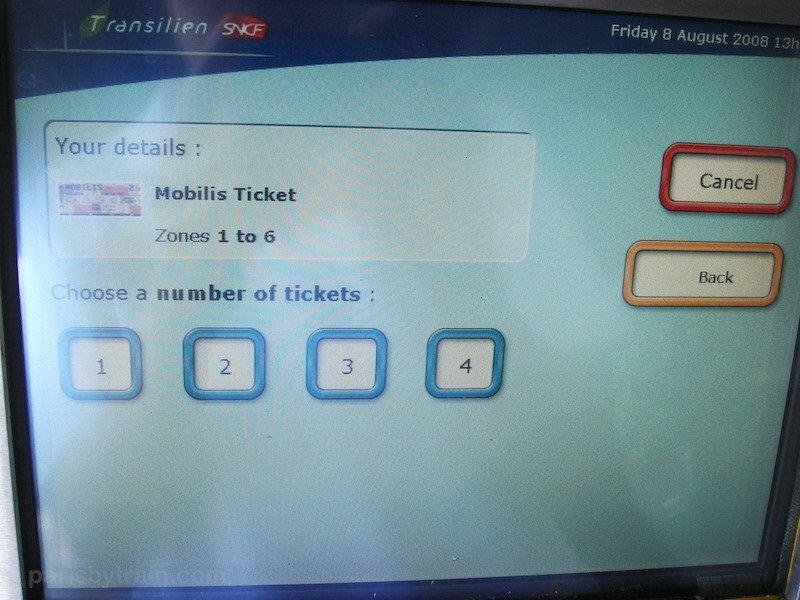 In this case, the machine is located in Zone 5 and thus to be valid for use here, the Ticket Mobilis covers zones 1 – 5. If you purchased this ticket in Zone 4, it would be Zone 1 to 4 (with more zone choices available through the “Other Options” selection). Cancel button: Ends this purchase session, returning to the (French) welcome screen. Other options: If you’re wishing to travel to another train station other than the default destination (Paris), this is where you would find that option. You will be asked to specify the name of the destination station through an on-screen keyboard. As you start to type the name of the destination station, the machine will offer suggestions depending on what you’ve entered. Click on the desired station name when it appears below the on-screen keyboard to select it as your destination station. At that point the ticket machine will price the station to station billet Ile-de-France and present you with quantity options (how many tickets you wish to buy). Ticket(s) to Airports: Travel to Airport Charles de Gaulle and Airport Paris-Orly are specially priced and require their own specific billet Ile-de-France. Book of tickets Ticket t (Metro/Bus/RER) in Paris: For convenience these billetteries offer carnets (books of 10 or 20) of single ride tickets for the Metro, Bus, RER, Tram within Paris. 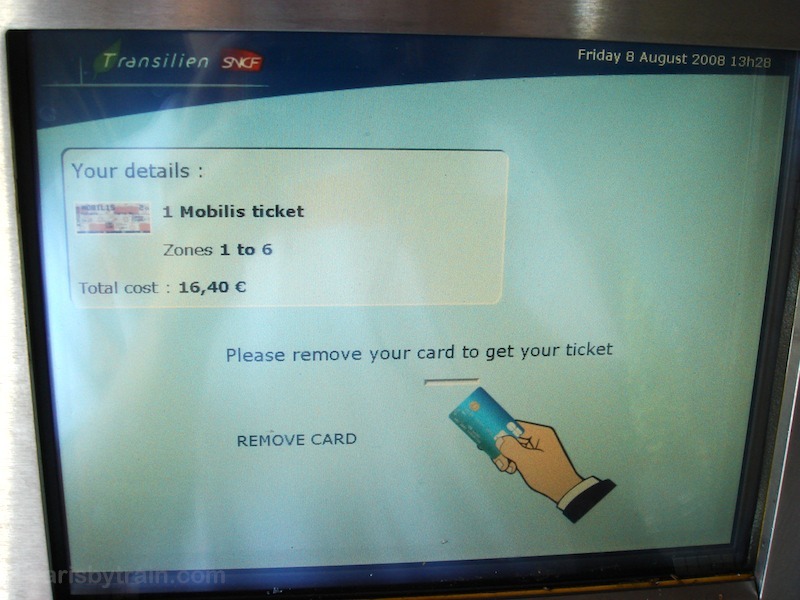 These tickets, known as Ticket t or Ticket t+, are not valid for station to station travel outside of Paris (which require billets Ile-de-France). Paris Metro Ticket t+ are valid for voyages on the Paris Metro (subway which covers zones 1 & 2), Bus and Zone 1 for the RER. 1 book of 10 tickets: This selection is for buying a carnet (book of 10) of billets Ile-de-France for a particular voyage from this station to another station. These tickets will be valid only for travel between these two stations in particular. Don’t try to use these tickets departing from a different station other than the two you’ve specified during the purchase routine. On this screen we choose the number of individual tickets we wish to purchase. 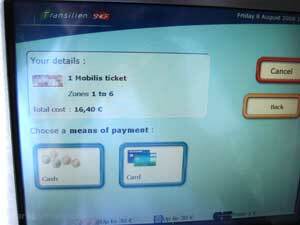 In this example I’m purchasing a single Ticket Mobilis 1-5 Zone day pass for a day trip into Paris from Fontainebleau. I chose a Ticket Mobilis because I knew I’d have to make a same day round trip to Paris, with several Metro/RER rides while in central Paris. 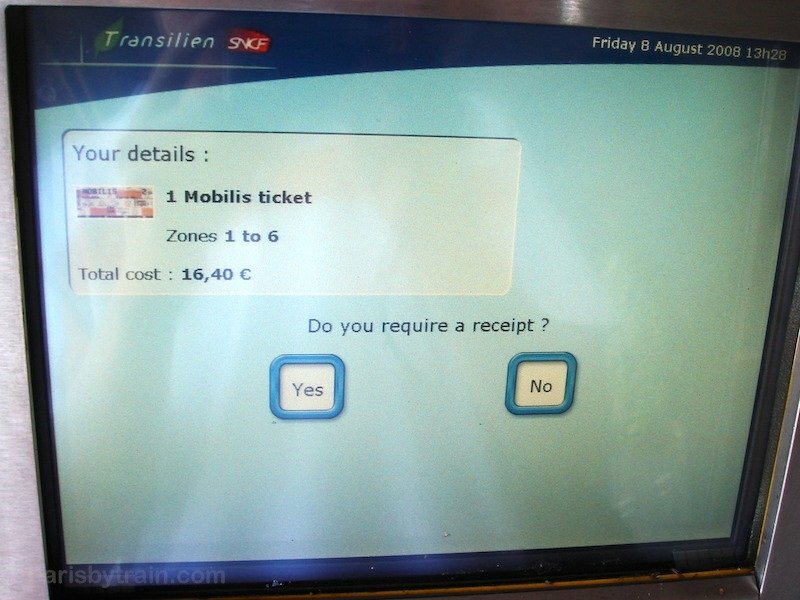 Thus the Mobilis makes the most economic sense and is also convenient, being a single ticket I use over and over, rather than multiple separate tickets I must keep track of. 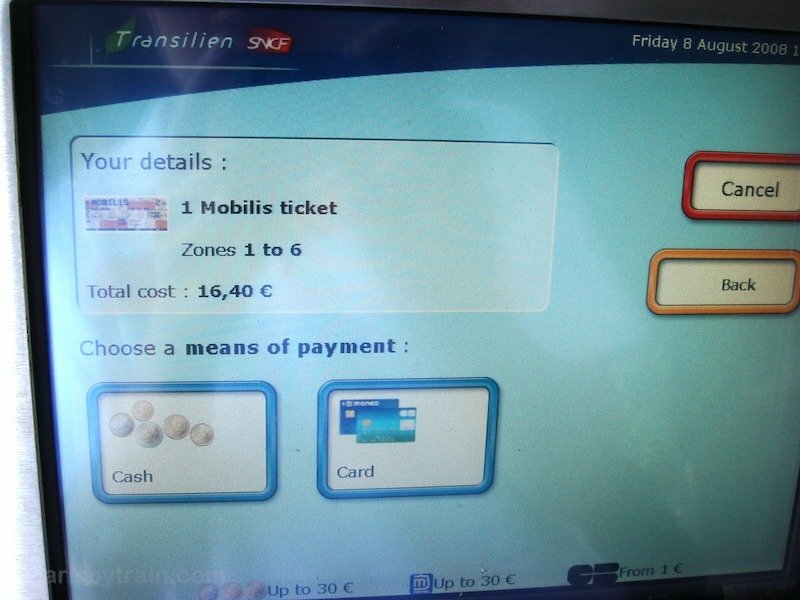 Keep in mind that Ticket Mobilis day passes are not valid for voyages to or from Airports CDG nor Paris-Orly. Pass Navigo Decouverte, if you have purchased one, is valid for CDG Airport, granted that you have purchased the zones necessary (5 zone for CDG). 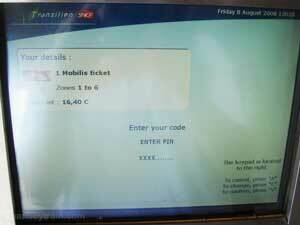 This is the payment screen for the Billetterie Ile-de-France ticket machine. Here I must choose Cash or credit/debit card. Although the choice reads “Cash”, these ticket machines only accept Euro coins, not Euro bills. When paying by coins, selecting the Cash button will unlock the coin slot, otherwise, it will be blocked. Here I’ve chosen to pay by Carte Bleu debit card. After inserting your European smart-chip credit/debit card, wait for the reader to (slowly) read the card. (North American credit cards are not accepted, except for smart-chip cards available from a few select banks). PIN code security is required for all credit/debit card purchases. Three consecutive errors on entering your PIN code will block your card. Complete the purchase by removing your card when you see the above screen and hear the chirping noise coming from the machine. The final question is whether you’d like a receipt printed or not. The receipt will be printed on a blank ticket. After this, simply wait until the tickets you’ve purchased are (slowly) dispense at the bottom collection tray. If you’ve paid with coins, collect your change (if any) from the right hand side of the collection tray, separated from the tickets.